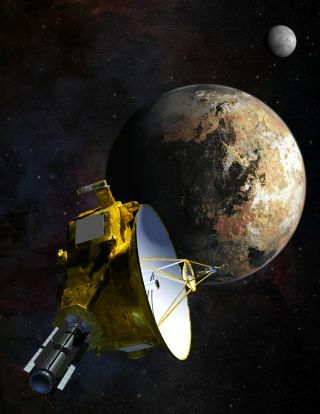 Artist's concept of NASA's New Horizons spacecraft flying throug the Pluto system on July 14, 2015. Researchers working on NASA's New Horizons mission have submitted for official approval a long list of crowdsourced names that will help fill out the first-ever maps of Pluto and its five moons. New Horizons team members submitted names generated by the "Our Pluto" campaign to the International Astronomical Union (IAU) today (July 7), one week before the probe makes history's first flyby of the faraway dwarf planet. The July 14 close encounter — in which New Horizons will zoom within 7,800 miles (12,500 kilometers) of Pluto — will reveal many different surface features, such as craters and mountains, on the dwarf planet and its satellites (Charon, Nix, Hydra, Kerberos and Styx). Indeed, the probe's images have already shown that Pluto harbors diverse and complex terrain, including mysterious dark blotches along its equator. But New Horizons team members don't have to come up with all the names needed for these features by themselves, thanks to Our Pluto, a joint project involving NASA, the IAU and the SETI (Search for Extraterrestrial Intelligence) Institute in Mountain View, California. Our Pluto asked people around the world to suggest and vote on potential monikers for features New Horizons detects in the Pluto system. The project spurred tens of thousands of name proposals during its March-April run, NASA officials said. The New Horizons team has now sorted through the huge database and sent their recommendations on to the IAU (which famously reclassified Pluto as a "dwarf planet" back in 2006). "The world put their minds to it and came up with this incredibly diverse list that covers every culture," New Horizons co-investigator Mark Showalter, of the SETI Institute, told Space.com. "It covers modern literature and ancient mythology and everything in between, and history. It's very eclectic. I think it's a very interesting list of names that people will enjoy." The IAU submission breaks down the proposed names for Pluto features into six themes: Space Missions and Spacecraft, Scientists and Engineers (including Pluto discoverer Clyde Tombaugh), Historic Explorers, Underworld Beings, Underworlds and Underworld Locales, and Travelers to the Underworld. Showalter said the "Historic Explorers" theme particularly resonates with him. "Having Norgay and Hillary at the top of that list seems incredibly appropriate to me," he said, referring to Tenzing Norgay and Edmund Hillary, who in 1954 became the first people to climb Mt. Everest, Earth's tallest mountain. "In my worldview, Pluto is the Everest of the solar system that we're just about to summit." The monikers pegged for Charon, Pluto's largest moon, likewise have four themes, while each of the other four satellites has one theme associated with it. It will probably take a while for the IAU to work through the list, but the New Horizons team won't leave the evolving Pluto maps blank in the meantime; they'll assign names on a provisional basis until official approval comes in, Showalter said. You can read the submission to the IAU, which lists all the names and the themes under which they fall, at http://www.ourpluto.org/pluto. The team plans to submit additional names for approval in the future as well.